So you’re watching a movie, enjoying your night out at the movies, and then some nitwit in the audience projects the price tag onto the furniture in the scene you’re watching. WTF? I find it hard to believe that this is true, but apparently it is. According to Buzzing Bees this is a campaign by DDB for IKEA which took place in cinemas in Berlin. 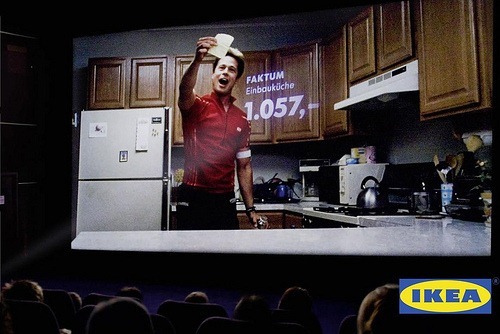 The cinema visitors received IKEA catalogues when they left the theatre… so they could throw it back I suppose? Over the edge if you ask me. I don’t think anyone who received a catalogue will think ‘Yay, let’s go to Ikea tomorrow’. Cool idea, but it would probably make me want to kick the guy and I’d at least demand my money back.